Medical Gifts - If you need some thank you gift ideas for doctors - stat, check out eMedDecor & More's enormous supply of medically themed doctor gifts that are only a heartbeat away. From gag prescription pads to doctor figurines, periodic table magnets to personalized bookmarks, choose from clothing, collectibles and decor, office accessories, personalized items and more doctor gifts that will get their pulses racing. Nurses Gifts - They nursed you back to health and gave you plenty of TLC, don't they deserve a nice gift? Whether you choose an adorably plush stuffed animal, a nurse pin, keychain, frame or a nurse hat charm, you'll find a lovely selection of nurses gifts that will show your appreciation and then some. Pharmacy Gifts - You've stocked up on plenty of medical gifts for doctors, but don't forget your pharmacist and technicians! 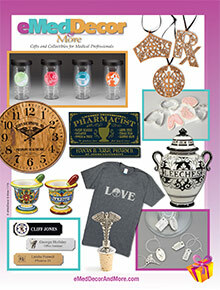 Find Rx inspired medical gift items at your fingertips from mortars and pestles to pharmacy flasks, welcome decor signs and vintage pharmacy tools. After gifting them with pharmacy gifts from eMedDecor & More, they'll be sure to get your next prescription ASAP. Veterinarian Gift - They got rid of Spot's fleas and Mrs. Mufflesworth's hairballs, you owe your vet - big time. Give your vet and technicians a medical gift they'll treasure from eMedDecor & More like animal themed mouse pads, stationery, vet ornaments, a handsome vet collage tie and more. Whether you need a supply of doctor gifts, dentist gifts, pharmacy or veterinarian gifts, find them all in the eMedDecor & More waiting room. Browse their website to see their full line of gifts for medical professionals - doctors, dentists, EMTs, nurses, pharmacists, veterinarians and more!